Shannon Brown is diagnosed with autism and bi-polar disorder. On Episode 7 of The Facing Project Shannon shares his inner thoughts and how listening to him and allowing him to make choices has improved his life. A man with autism and bi-polar disorder gives a peek inside of his mind and explores a friendship that helped him discover that no challenge in life is too difficult to overcome. Listen to Shannon Brown’s on Episode 7 of The Facing Project Show. Want to talk about it? Join our Facebook Group where we talk about podcast episodes, discuss stories and issues, and take action as a community. 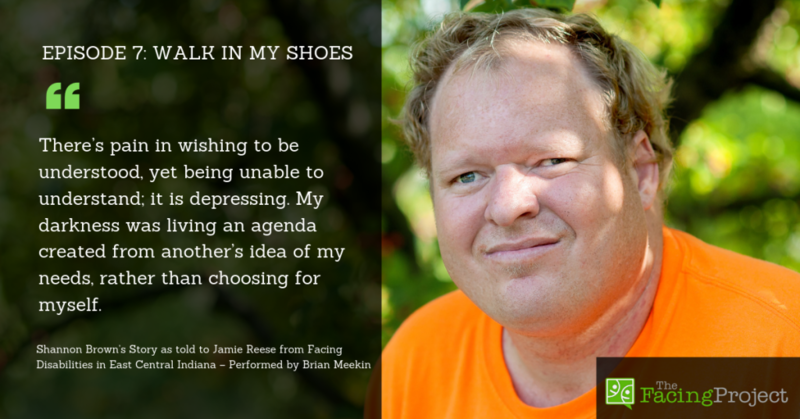 Shannon Brown’s story as told to Jamie Reese from “Hillcrofts’s Facing Disabilities in East Central Indiana” performed by Brian Meekin. I cannot stand to be misunderstood. The only thing I hate more than that is not understanding what’s going on. Or why something is happening to me. Or when people leave me. All those things are confusing . . . and make me hurt myself. I try to explain what is wrong with me when I’m feeling bad, but my words get muddled and become something I didn’t even want say. I’ve done things that I didn’t want to do. Then people give me that look . . . The sound of a shovel scraping across the rocks on the driveway—that is my joy and sunshine. The plow cleaning my driveway after the snow comes is my thrill ride. Swinging, with my feet scraping the grass, on a hot morning while I wait for my best friend to take me to lunch at BDubs—that is my best day ever. I enjoy outside so much, with the blue sky and the funny white shaped clouds that slowly float above me. It gets so hot in the summer, but I love it hot. Not always, but sometimes. My dad playing music gets me jamming. I love to dance! I’ll play games with you and will always win! You can’t beat me at UNO! But let me tell you, I go much deeper than dancing, UNO, sunshine and scraping rocks, and scaring people. Listen! The storm is rumbling in and though it may come with uncertainty, noise, and unpredictable wind, it brings with it tons of beauty. If it weren’t for the clouds, how would I know how beautiful the sky is when they disappear? There is no reason to fear the unknown except when the unknown comes unexpected. We are born into situations and given a straw that we never drew or choose for ourselves. Some are born with all the gifts wanted by mankind: good looks, intelligence, wit, personality and charisma, an ability to communicate effectively, and a compassion that cannot be taught. I’m not one of those people. I don’t’ know what I’m born without; I know what I have. I have love and I have hurt; I also have happiness. I wasn’t always happy, though I’ve had a happy life. I was born with several conditions, yet I don’t think they have caused me much trouble. I have Autism, Tourette’s, Moderate developmental disabilities, and Bipolar Disorder. These labels have stopped others from trying to understand and that has made it hard for me to understand my life. I’ve been hurt a lot. By people who don’t know me. And by those who do. . .
It’s the pain of being misunderstood. I have wants and needs clearly known in my mind, but have an inability to be begin to communicate them. There is great pain of knowing what is wanted, but not being able to say! Why can they not be seen? Yet, some see; my mom and Jeff, my dad. My friend Angelica did what few before her had ever done; she listened. By them I have become empowered. I found my voice in funny words, fuzzy words; nice words. I have misguided excitement that meets a stranger with force- a force that causes fear with my unwitting delight. In cursing and self-destruction, my joy and frustration was being communicated. The words were what they were not; the intentions lost in the aggression. Nobody has taught me to love, for when you meet me, you see it and feel it; yet I was taught how love loves. I started to recognize what the world sees and replace it with what the world accepts. I was depraved of communicating and understanding my surroundings. The smallest routine changes caused me undue stress. I needed choice, and she gave me choice. I love babies, oh how I love them! I love to play in the park, swim, play basketball, and do . . . everything. I love to swing and look at the sky. We tried to reach the sun on those swings. We almost knocked trees down with our feet. At my favorite restaurant, I was waiting for my wings. Then I am patient and play the game while waiting for my wings. . .
And when I got loud or cussed because I wasn’t patient, she let me get candy from the claw machine. I followed her rules because if I didn’t, she would take me home. The people and the sounds that overwhelm me in the outside world make my words loud and bad. “Shan,” she’d say . . .
And I started going to my shop to work on my crafts. I could go to the animal shelter and play with the animals. Animals are like babies; they need space and a soft hand. I love to burn the trash at my parent’s house. I start the fire and say, “Is it . . . is it . . . BURNING? “It’s burning now!” She’d say with a laugh. I did not know the storm could not hurt me until Angelica was scared of the storm. She was so scared and I told her it was God bowling. The rain waters mommy’s flowers. She was okay and that helped me realize the storm could not hurt me, either. People would come to my house and tell me I have to go wherever they wanted to take me. I didn’t know they were coming and I didn’t know where they were taking me. I started telling them to call me first and let me decide. And I saw myself differently. I could make decisions and I learned control. Before, when people didn’t call first, or ask me what I wanted to do, I would get anxious. I hated not knowing what was going on! I just don’t like change that I don’t expect. It made me get a tight feeling in my chest and a rumble in my belly. My head was spinning and my ears heard too much. I would hurt myself or others. I found that if I rocked in the chair with the lights turned down and the music playing, I could relax. I could ask to relax when I felt like this, and I started to feel better. I could go where I wanted or where others wanted me to go because the relaxing helped me. I still get this feeling sometimes, but now I know how to relax. I once wrestled within myself with things I could not say, that I did not understand. Trust was a stranger, and I was my enemy. There’s pain in wishing to be understood, yet being unable to understand; it is depressing. My darkness was living an agenda created from another’s idea of my needs, rather than choosing for myself. There is no challenge in life too difficult to overcome if you have the right person with you. I found my right person. She did not run away when I scared her with my bad words when she came to my house the first time. She looked at me and saw that I needed help. We chased the sunsets together. We caughtMan rainbows. Everyone should have a friend like Angelica. Angelica says everyone should have a friend like me. What is The Facing Project? The Facing Project’s mission is to create a more understanding world through stories that inspire action. Inspired to get involved after reading this story? Here’s how you can help. DONATE: Your donation will help support storytelling projects around the country. On average a $10 donation helps produce one story like the one you just read, and a donation of $200 can help help us support an entire community project. GET INVOLVED: Learn how you can start a Facing Project in your community. SUBMIT A STORY: Are you ready to share your story? Are you ready to help someone share theirs? 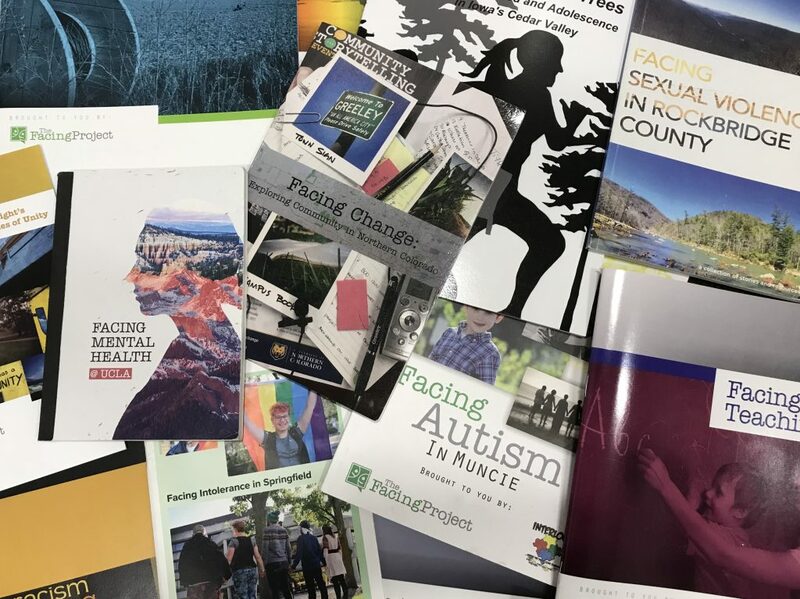 It’s easier than ever to contribute to The Facing Project. JOIN THE CONVERSATION: Share this post with someone who needs to hear the story, and continue the conversation on our Facebook Group, where we discuss each episode of The Facing Project Show.